Moo Ping (literally Grilled Pork) are little skewers of porky deliciousness, and probably Thailand's most popular street food. The pork should be shoulder or loin (not belly). You'll need about 100 grams (3.5 ounces) per person. Chop the pork into bite-sized chunks. If there's any fat on the meat, leave it on - it'll help with the flavour. Finely chop the coriander (cilantro) and pound it to a paste with the white pepper and garlic. Mix the fish sauce, soy sauce and honey, and add the paste. Pour into a freezer bag and add the chunks of meat. Massage the bag to get all the meat coated, and put in the fridge to marinate, ideally overnight, but at least 2 hours. Thread 4-5 pieces of meat onto a skewer - you should have 2 skewers per person. Brush all over with coconut milk. Place on a barbecue or under a hot grill (broiler) and cook for 5 minutes. Brush with coconut milk again, and cook for another 5 minutes. Depending on how hot your heat source is, the meat should now be cooked. If not, give them a few minutes more. Serve the meat on the skewers with some Thai sticky rice. The video above is from the Keef Cooks YouTube channel. 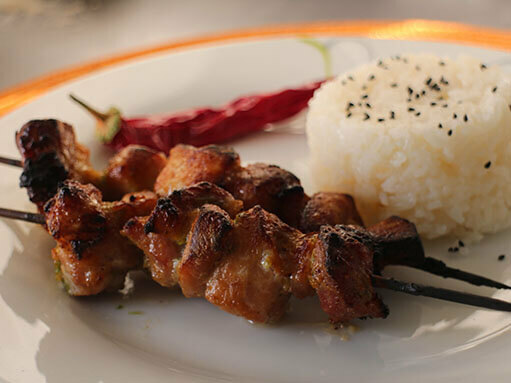 Click here to see the video recipe of Moo Ping - Thai Pork Skewers on YouTube. Prep time: 5 minutes. Marinading time: 2 hours.